Krista Anken '17 writes that she has been working at a US Air Force lab and is applying to graduate school, where she plans to take courses part-time, leading to a Master's degree. Krista was a computer science major at William Smith, with a minor in mathematics. About her job, Krista says, "I work at the Air Force Research Laboratory, Information Directorate in Rome, NY. Our Mission is to explore, prototype and demonstrate high-impact, game changing technologies that enable the Air Force and Nation to maintain its superior technical advantage. The first few months I've spent time performing research and development of technologies focused on text analysis, geo-spatial object tracking and multi-intelligence data fusion." Billy Bird '17, who majored in computer science at Hobart, writes with some news about what he has been doing since graduation. Billy has been working for the past three months for the consulting firm Booz Allen Hamilton. His position there is DevOps Engineer, and he says that he really likes the work and his co-workers. Billy writes, "I'm working on an NSF (National Science Foundation) project, and we support 15 different internal and public applications. DevOps is super interesting (google it!). We're sort of 'generalists,' or 'full stack;' we support every application team through continuous integration, continuous delivery, automated testing, and other cool stuff. There's a big learning curve, but I'm having a blast." Hobart Alum and Computer Science Major Shaun Viguerie '12 reports that he has started writing mobile phone apps, working together with Marc Bertucci H'12. 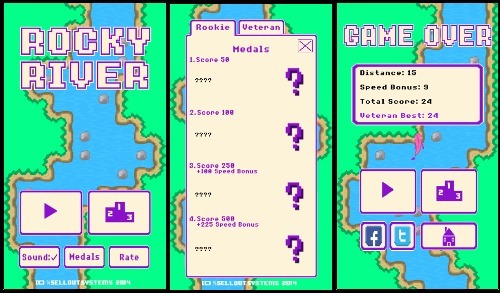 Their first entry in the iPhone store is a game called "Rocky River," in which the player tries to guide a salmon upstream through a river full of rocks. Shaun says, "Be forewarned -- the game IS difficult -- there is a rhythm to it -- once its figured out the game becomes quite fun and addicting." A version for Android should be coming soon. For his regular job, Shaun works at Markit Financial Information Services, along with fellow HWS alumni Kathryn Middleton '14 and Joseph Howe '14. Joe has an upcoming solo show at TFNF Gallery in Brooklyn. 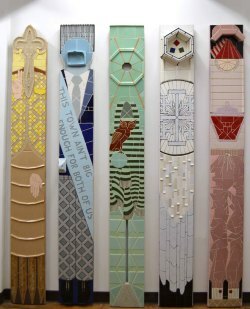 The show, entitled Permission, consists of a new series of figurative wall sculptures made with ceramic tile. 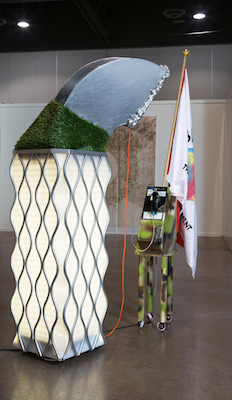 The show will be on view until November 28th. Open gallery hours are on Saturdays, 12 - 4 PM. See more at Relationships. Derrick reports: "I left my job at White & Case LLP (where I had been since I started practicing in November 2009) back in May, and in August started up at the New York office of an economic consulting firm called Analysis Group. Among other things, Analysis Group supports economic experts in litigation cases. They thought my background in mathematics and physics, and my law background would be perfect complements. So far it has been great, and I'm sure it will be even better once my technical skills get fully dusted off in my head." Derrick is also a member of the Hobart Alumni Council. I'm excited to say this June I graduated from the Rhode Island School of Design with my MFA! The thesis exhibit has come down, however there was a review that included my work out of the 200 grads shown: Really Big Show. This piece is entitled "William and Patty Hearst." Also, if you are in New York this July, my class of painting grads have a group show at Projekt 722. in Brooklyn. The opening is July 13th while the show runs from July 6 - 28. You should know I'm still using what I learned in math/CS: my thesis drew on some vector field ideas and I typeset it in LaTeX!